Saw Basterds last night,the story follows a motley crew of Nazi killers, all Jews aside from the part Apache 1st Lt Aldo Raine and crazed ex-Kraut, Sgt Stiglitz. It also follows a French Jewish woman who escaped the Nazi killing squads led by Col. Hans Landa to Paris where she opens a cinema soon to be the focus of the film’s final set-piece…it also follows a British film critic turned Army Captain’s secret mission to contact a German film star who wants to turn state secrets. Basterds feels like a hodge-podge of ideas that never coalesced into a singular theme. I’m not sure why it was called Inglorious Basterds for the amount of time you spend with them, getting to know their characters, it could have been called, “The French Cinema Propreiter,” or “Random British Film Critic Commando.” Most of the crew end up as unexplored silhouettes, used only as stand-ins for action scenes. Definitely no Dirty Dozen. Strong performances by Cristpoh Waltz and Malanie Laurant, but Pitt’s protean Brando impression was distracting. Tarantino’s exploitational cutaways, whimsical fonts, and anachronistic music choices draw you out of what could have been immersive dialogue scenes, but ultimately most of those could have been edited back as well. Some moments of interspersed brilliance, like the final set-piece, but other action scenes were brief and overcut. Somewhere between Grindhouse and Reservoir Dogs, but too confused and self-indulgent to be either. 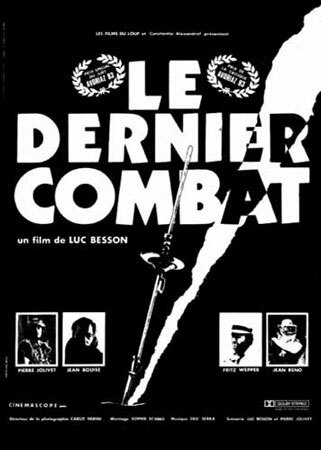 Besson’s first feature length film, the Last Combat has the unique disitinction of being the only silent, black and white, post-apocolyptic, action/comedy. Already, Besson’s style and genious presents itself in an engaging story that is poignant, thrilling, and funny. Jolivet plays the unnamed hero, who uses his wits to first defeat a group of thugs and attain a battery for his homemade plane, then again to best a brute played by Jean Reno and save a captive woman. Despite there being no dialogue, Besson manages to establish notable characters and genuine relationships such as the partnership between the hero and the doctor who is protecting a hospital and the woman in it. Also to note are the brilliantly captured slapsticky moments that come to identify Besson’s directing style such as the hero experiencing alcohol for the frist time and Reno’s character’s failed attempts to gain access to the hospital.